Home > Portfolio > Kitchens > Private Residence, Wake County. Private Residence, Wake County. 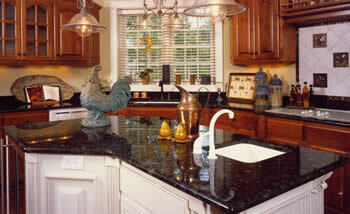 These countertops were constructed with beautiful Verde Butterfly granite, which is quarried in Brazil. The house, built by Olde Heritage Homes, was a first-place winner in the Raleigh/Wake Parade of Homes.